December 13th, 2016 - 6:01 pm § in Misc. On Trump: He won the election because people, like myself, are tired. December 13th, 2016 - 12:50 pm § in Misc. AFTER TRUMP: A German Bomb? December 13th, 2016 - 6:48 am § in Misc. Michael Hood: Where did the DNA go? 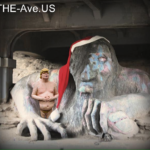 You are currently browsing the The-Ave.US blog archives for the day Tuesday, December 13th, 2016.